Fashion continues its flirtation with art. Young and up-and-coming brands particularly are occupying galleries, often exhibiting things far removed from the body. Is it that creatives feel the need to and are expected to master multiple disciplines or just an evolution of fashion communication utilised by fashion brands? Address contributor Abi Buller considers this, following her visit to fashion designer Charles Jeffrey exhibition at London’s NOW Gallery. An adults’ playground, a sculptural fantasy, a visualisation of an iconic club night. Fashion designer Charles Jeffrey’s exhibition The Come Up on view until 11th February at NOW Gallery offers a playful and intimate view into the designer’s thought process. 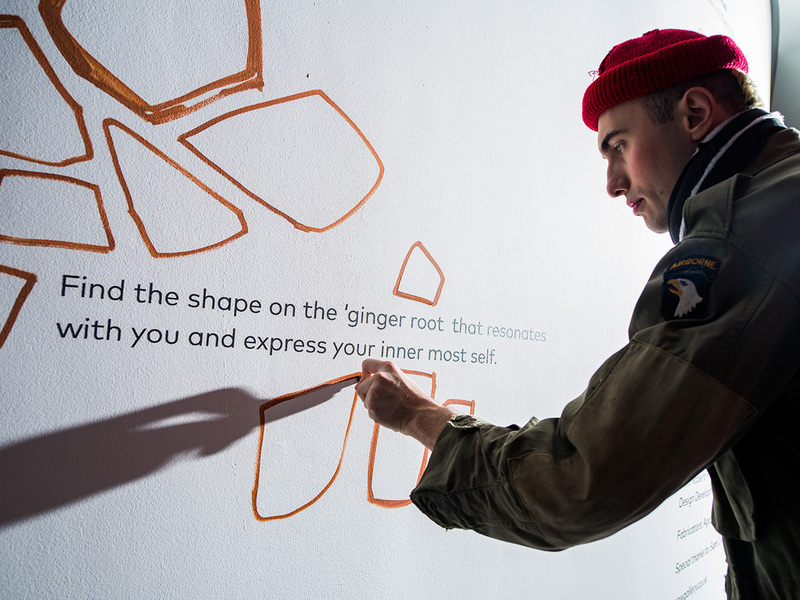 Upon entering the gallery, visitors are instructed to collect pens from the gallery assistant and with a license to draw directly onto the ‘ginger root’ sculptures present at opposite ends of the space. No longer just passive viewers of the artworks, the audience is encouraged to ‘open up their alter egos and let creativity take over’. 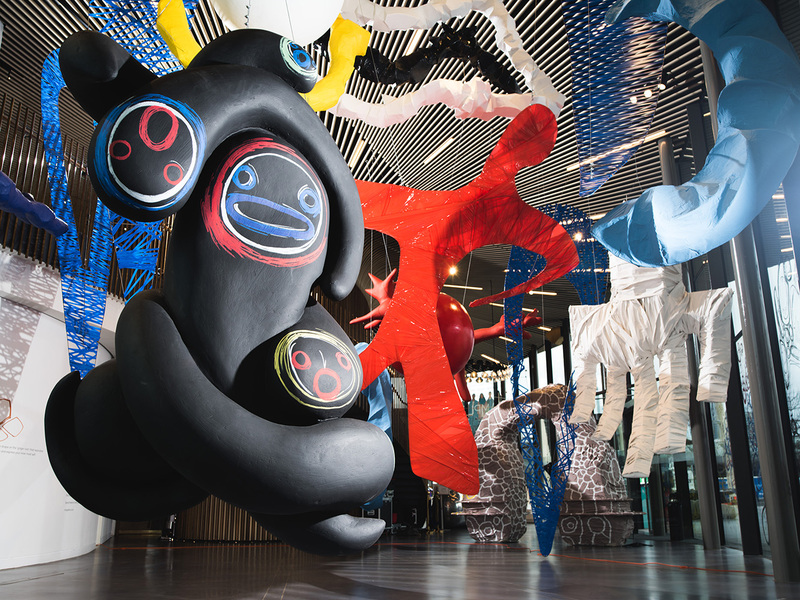 The two root sculptures sit among an array of similarly abstract sculptural pieces suspended from the ceiling. Present in the primary colour hues of red, blue and yellow, these pieces continue to hint at the novel and unrestricted extent of the designer’s mind. While the hanging works appear more polished and not dissimilar to the set design often present in Jeffrey’s catwalk shows, the ginger root sculptures are invitingly amateurish in a dull brownish tinge formed by painted stumps of a sort of grown-up paper mache. Despite their somewhat plain aesthetic nature, life is brought into them through a patchwork of doodles added in with fluorescent paint pens provided by the gallery. An intimate and accessible approach to fashion communication, the designer’s relationship with the art space allows for experimental curation and a childlike approach to sourcing inspiration. The idea that the sculptures are incomplete until visitors have left their mark on them, acts as a physical representation of user-generated digital content. Although the designer’s sculptural works are reminiscent of his fashion garments in aesthetic style, the exhibition itself doesn’t include any exclusively fashion-centric pieces. To the uninitiated eye, the works on view could indicate the designer as a sculptor or a fine artist, without any correlation to a fashion design background. The effect of this perhaps connotes the conceptual nature of the Charles Jeffrey brand and nods to the exaggerated visual style and exuberant ethos of the designer’s style. The exhibition marks the third installment of NOW Gallery’s fashion commissions. Opening the series, Phoebe English presented an intimate and introspective look into her design process. Titled Floating, Falling, Drowning, Flying, the exhibition featured previously unseen artifacts in curiosity cabinets including sketchbooks, photographs, tools and research images. Following on from English and much like Charles Jeffrey, Molly Goddard’s exhibition invited viewers to immerse themselves in the designer’s work, giving them the opportunity to interact with the exhibit by embroidering onto the garments on display. This type of interactive exhibition breaks the barrier of fashion being exclusive and reserved for those in the know. Despite the similarities of audience interaction, Goddard’s show focused solely on fashion garments and encouraged members of the public to actively alter the garments and therefore immerse themselves in the craft of design. Perhaps then, it is Jeffrey’s desire to expand upon his fashion designs and utilise the space of an art context to position himself as a creative practitioner beyond the landscape of fashion design. With experience economy becoming ever more prevalent, fashion brands are having to respond this desire and present new ways of promoting fashion and creativity through multi-faceted outlets. As noted in The Experience Economy, ‘’…the greatest opportunity for value creation resides in staging experiences’’ (Pine and Gilmore, 1999). The purpose of staging an experience with lasting value is perhaps utilised as an alternative approach to a stand-alone retail store. While each of the three commissioned designers stock their garments in retail stores such as Dover Street Market and Selfridges, they all lack the addition of an individual bricks and mortar offering. Through collaboration with an arts venue, these young designers have been able to express their voice in a creative space which has the ability to reach the scope of a broad and varied audience. These three exhibitions are representative of NOW gallery’s values of supporting the fashion industry. Exhibition curator Jemima Burrill states: “NOW Gallery takes fashion seriously and sees the NOW Fashion commission as an important part in the exploration of great UK design brought to life in this exciting gallery space’’. Considering the importance of communicating fashion as accessible and inclusive, NOW strives to make the experience both informative and enjoyable by offering an opportunity for the audience to participate. With his exhibition, Charles Jeffrey’s offers an interactive, three-dimensional representation of the designer’s Loverboy brand and cult club night (hosted at Vogue Fabrics situated in Dalston, London) which is incomplete without the assistance of visitors. Jeffrey’s exhibition was promoted with a humorous film trailer created in collaboration with NOW, featured on the gallery’s website in the lead up to the exhibition launch. This self-deprecating trailer plays on industry stereotypes, taking a comical approach to the process of creating and promoting an exhibition. Acting as a form of teaser-style promotion, this moving image piece also positions the designer as a creative talent through means beyond his fashion garments. By profiling the identity of Jeffrey in this way, audiences are likely to relate to the designer as both a personality and as a fashion brand. These sharable and interactive brand touchpoints are potentially paving the way for a new generation of fashion designers. 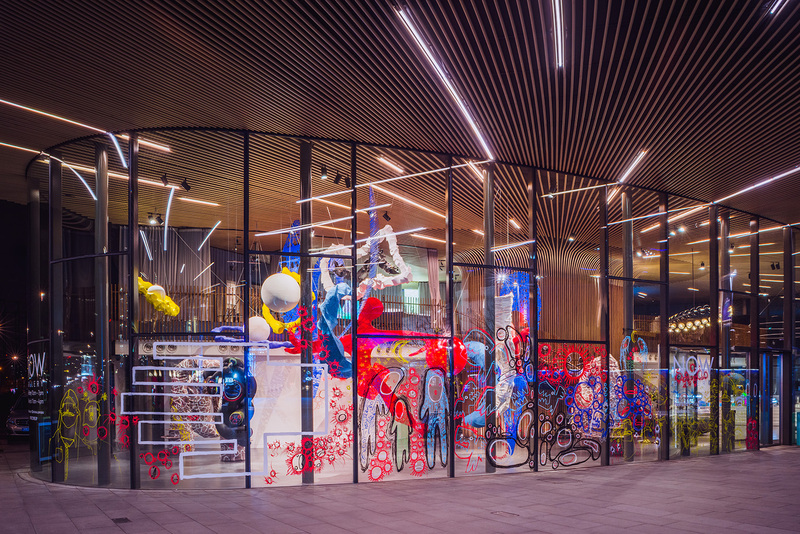 For brands without funds for traditional outlets of fashion communication including catwalk presentations, magazine advertising and retail stores, could joining forces with established arts venues be the answer during the time when the fashion industry is in flux?